Middlebridge Scimitar Ltd acquired the manufacturing rights and all tooling for the GTE and the convertible GTC version in 1987. Hand built at the Middlebridge Scimitar plant in Beeston, Nottingham at a rate of 300 cars per year (never attained), the new GTE retained the classic Ogle sports estate design penned by Tom Karen. It is powered by a Ford 2.9 Litre fuel injected Scorpio engine that produces 150BHP. It has either a five speed manual gearbox or a four speed automatic unit available as an optional extra and a top speed of 140 + mph. 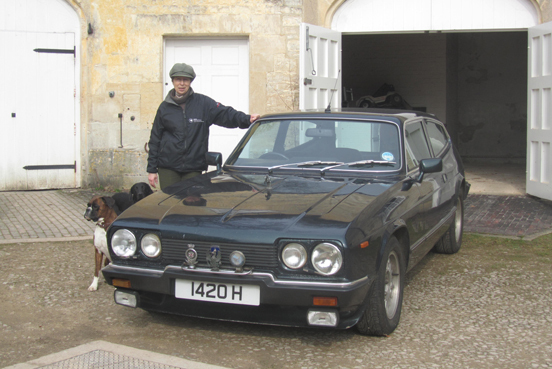 This site is dedicated to the little known Middlebridge Scimitar and features individual Gallery positions for every car built. This is a non commercial site run by enthusiasts for enthusiasts. The MB (Middlebridge) Gallery needs to be as comprehensive as possible for reference purposes so please email piccies and details of your or any Middlebridge. Hopefully this site will in time develop into a useful and informative tool for enthusiasts Buying, Selling, Maintaining and Restoring their Middlebridge Scimitars. We are still striving to further improve marque awareness and popularity. My own restored Middlebridge currently forms the basis of the my car link. The Mess has already attracted new enthusiasts from all over the world with cars having found new owners throughout Europe. We aim to continue our quest to improve the marque status, desirability, and values indeed the site has had for some time a waiting list for these fine cars. "Built with virtually indestructible mechanicals, fully galvanised chassis and a GRP body - you don't just own a Middlebridge, you are scim-ply its Custodian for the next generation." Mick Gaughran. Site developed by Martin North.